Every day we do something a little different here in Uganda, but in many ways every day we also do a lot of the same things. I don’t mean to say it’s mundane, because it’s not. It’s just that everyone on the team knows now how to set up each part of the medical clinic, including putting everything on the bus and taking it off. Everyone knows how where to put the pharmacy and who are the best people to work in it. (Optometry – hello!). Everyone knows what has to be done, so when we hear our assignment for the day is to do a medical clinic or a de-worming clinic at whatever the location is, we’re on it. But everyone on the team seems to have a place or a job or a certain kind of population that pushes their buttons. Sometimes they can tell you why; other times they just know it’s where they need to be spending time, and they can’t necessarily explain it. So when that place comes up on the schedule, there’s just kind of a “this is the place” feeling about it. It doesn’t mean we’re not happy to work in the other places, too, and this is a great team and everyone does whatever needs to be done no matter where it is. But, everyone seems to have the spot and when they find it, they know it. Today I found the spot. I’m not sure why, but this particular church out in the middle of nowhere where we did a de-worming clinic today, may be the spot for me. I’m not saying I’ll necessarily ever go back there, or maybe I will. Who knows. But I think this may be the spot where I’ll want to be more involved somehow. We’ll see what happens. 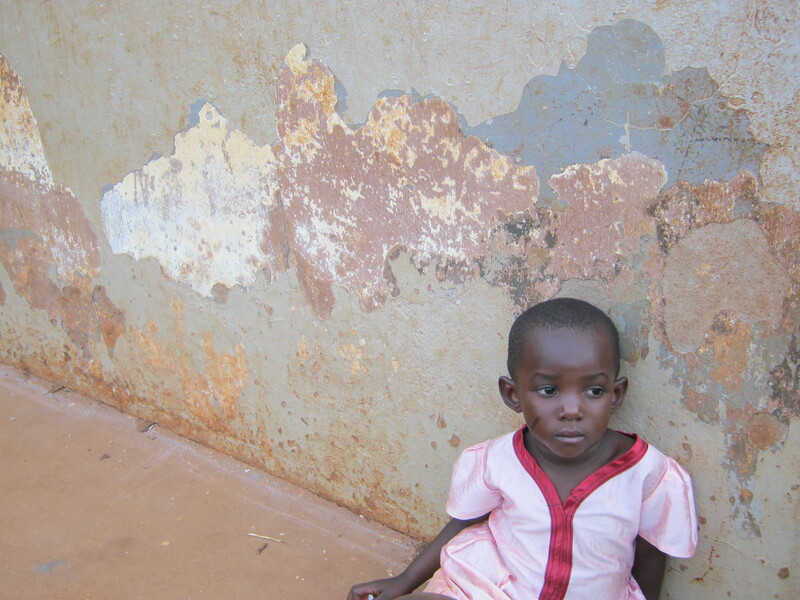 The photo above is a little girl, whose name I don’t know, hanging out on the porch of the Elim Pentecostal Church. That’s the spot. I can’t remember exactly where it is, but I know it’s approximately a million miles by bus from Kampala, through lots of crater-sized potholes in the road**. It’s also near the source of the Nile River where we visited today too, but I’ll write about that another time. The Nile was good, but it wasn’t the spot. The spot was down the road, where this little girl was. We’ll have to see what happens with it. 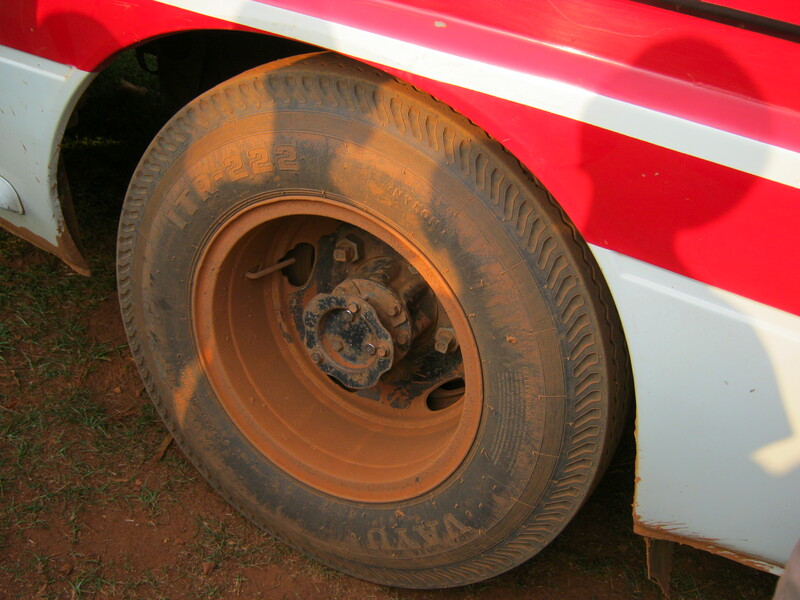 **Photo of one of the bus wheels, covered with the same red dirt that covers everything and everyone else. Love it! And look forward to hearing more …..